My laptop has run out of space on the hard drive and I want to replace it, but I've never done anything like that. 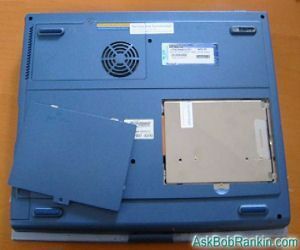 Can you give me the steps for replacing a laptop's hard drive? Choose the right replacement hard drive. Nearly all new laptops sold today contain 2.5-inch wide hard drives. But if your laptop is an older model it may need a different form factor. Check the specifications for your machine in the user manual or the manufacturer's support Web site. Keep in mind that even in the 2.5-inch drive category, most drives are 9.5mm thick but some higher-capacity drives are 13.5mm thick. Measure first, so you don't buy a drive that won't fit! The laptop's hard drive interface must match that of any new drive you buy. Typical modern interfaces include Serial ATA (SATA) and Ultra ATA/IDE. Older standards are available on new hard drives; you just have to be sure of what your laptop's hard drive controller supports. The rotation speed of a hard drive makes a big difference in read/write performance. Hard drives rotate at 4200, 5600, or 7200 rpm. Faster costs more, but it's well worth the few extra dollars. The capacity of a replacement hard drive should be about twice what you expect to use. Plenty of empty space on a hard drive makes the writing of data easier on the read/write head mechanism; it doesn't have to split files into as many pieces and write them in different places. Files tend to be less fragmented on a drive with lots of space, making read operations faster and minimizing read errors. The data transfer rate of a hard drive is another important performance factor. It is the maximum speed at which data can be moved in and out of the drive. Disk cache memory also speeds up data transfers by storing frequently used data in RAM right on the hard drive. The more cache memory, the better (and the higher the price of the drive). Don't hesitate to buy a high-end hard drive. The difference in cost between the middle and high end of hard drive price ranges is only about $50 to $100. A high-performance hard drive is one the best investments you can make in your laptop. Back up everything on your old hard drive to external storage. The easiest way to do this is with disk-imaging software and an external hard drive connected via USB or Firewire. A disk image is an exact duplicate of every bit on your hard drive, including the operating system and user settings; applications; and data files. Your imaging software should also help you create a bootable "emergency CD" to help you restore the image to the new drive. Do not use mere data-backup software or you will have to re-install the OS and all of your application software! See my related article Hard Drive Backup Image for more info, and links to some free imaging software. An alternative to creating your disk image on an external hard drive would be to create the image on your NEW drive. Then you can simply install the new drive, boot up and go. The only downside is that you'll need some way to connect that new hard drive to your laptop. But you can purchase an inexpensive kit ($20-$30) to turn your new drive into an external drive that can be connected via USB or Firewire cable. Remove the old drive from your laptop. This is the easiest part, usually. In most modern laptops, removing a single screw on the underside of your laptop that secures a cover plate over the hard drive is all it takes. There may be a clear plastic tab to pull the hard drive out of its bay. If not, just tilt the drive up and out of the bay. Check your laptop's documentation to locate the hard drive cover. Install the new hard drive. Just slide it into the empty drive bay. If it doesn't go all the way in, you have it upside down; the connectors are asymmetric so you can't accidentally install the drive incorrectly. Just be careful not to bend any of the pins that must slide into the connector on the laptop. Replace the cover and get ready to transfer your old drive's contents to the new one. Configure the new drive. When you power up the laptop its BIOS should detect the new drive automatically. If you created the image on your new drive, you're ready to boot up and go. If you created the image on an external drive, boot from the emergency CD, then use the image disk and your disk-imaging software to transfer all the data, apps, and operating system from your backup copy to the new drive. Of course you can skip the imaging altogether, boot up with a Windows Setup CD, and install a fresh copy of the operating system on your new, empty hard drive. But don't forget to install anti-virus and anti-spyware software; and visit the Windows Updates website to make sure you have the latest Windows security patches. Ta-da! You're done! All of this may take several hours if you have lots of apps and data on your old hard drive, but those backup and restore operations can run unattended while you're off doing other things. Most recent comments on "Replace Laptop Hard Drive"
One key factor to look out for when swapping to a larger capacity 2.5" drive is its thickness. Most are 9.5mm thick but some of the higher-capacity drives are 13.5mm thick and won't fit inside the laptop. EDITOR'S NOTE: Good point, I've added your tip to the text of the article. Surely this change will void the guarantee, so you must be sure to do it. It seems is far simpler than the same in a desktop computer, which i´ve done severak times. The procedure shall apply equally on a netbook?? EDITOR'S NOTE: A netbook is a laptop, so the same instructions would apply. When you reinstall the operating system, do you have to have the original code that was used for the operating system installation the first time? Are the apps programs that are on the computer? EDITOR'S NOTE: As for the license code: If you make an image and clone to old drive to the new one, this will not come into play. But if you reinstall Windows from the CD, yes, you will need to license code. If you have trouble during activation, you can call MS and explain that you're simply re-installing on a new drive. As for Apps: Yes, those are your installed programs. You didn't mention drivers. Of course a mirror takes care of this problem but for a clean install on an older laptop this can be a real problem. I know. Sometimes drivers are almost imposable to get and the laptop may not even run without them. It took me three tries to replace the hard drive in an old Toshiba. Only after buying a mirror software (Norton Ghost)did I get the job done. For a few $ more you can buy a 2.5" hard drive enclosure.Install the old drive and use it as a USB thumb drive. There are applications that you can install and run on your laptop without taking space on your new hard drive. You will need to clean your old drive to make room. 2. CLONE existing drive for backup. Recently had my 500GB drive crash. to clone the new good drive via USB. Only took about 3 hours to clone which is faster than an image backup/restore. Since hardware is inexpensive this is a great REAL backup solution. If performed weekly, coupled with "cloud" daily backup then this approach is hard to beat. It takes seconds to remove the "bad" drive and replace with the clone. Can not describe how many times this technique has saved me. Works on any windows computer. How do I do this (Upgrade my HD) without a CD drive??? I have a large USB drive, my current laptop drive, and the new one as well as nearly every freeware I can find that claims to image a drive. The USB drive has never booted anything except my DOS utilities. Perhaps that is not possible, but then how do I get THAT image to the new drive? I've some ideas, but they are more like straws. I'm ready to give up. This has NEVER happened to me before and I started with MSDOS! OK, I've NEVER spent so much time upgrading a hard drive. Never and as I've said, I've been around since MSDOS. So I think what I got to work might be of interest. Note that this laptop does not have a CD/DVD drive. I do have a USB drive large enough to image the original system drive, but how do I run imaging software? They all seemed to be live Linux ISO's. I've got my old DOS system, but what to use with it. Partition-Saving.com, but it wasn't quite that simple. The probably obvious answer that worked was a small primary system partition and a large logical partition. Worked great. The lack of a CD/DVD was the obsticle and finding an answer was quite a quest for me. BTW - Your archives is on my favorites bar. Can an old laptop handle a new hard drive with a higher capacity and a higher transfer rate? How about a higher speed? My old Toshiba Satellite P305-S8842 has two, 200-GB drives, SATA1. The main C drive failed, but the second drive is fine. Can I use a replacement C drive with more gigs (500) and also a higher (3.0) transfer rate, and also a higher speed (7200)?